This photo was taken on one of our Whale watching cruises. Note the white water of another whale just under the flipper. Our whale watching cruises are available from June through till November when the Whales return often showing off with their new calves. We offer group and single person charters but due to the nature of these giants cant predict when they will be here off Caves. Please stay in touch with our website and as soon as they arrive we will let everyone know via the latest news column. We will be offering exceptional value and hope to see you onboard. 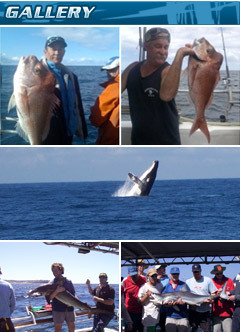 (Trips usually incorporate the Moon Island and Caves Beach Caverns, And are run in smooth to fair conditions only.